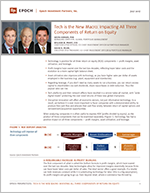 Tech is the New Macro - Part I: Impacting All Three Components of Return on Equity - Epoch Investment Partners, Inc.
Technology is positive for all three return on equity (ROE) components — profit margins, asset utilization, and leverage. Profit margins have soared over the last two decades, reflecting lower labor costs and the evolution to a more capital-light balance sheet. Asset utilization also improves with technology, as you have higher sales per dollar of assets employed in the business (e.g., plant, equipment and inventories). Regarding leverage, if you don’t need as many assets to run a business, you can return excess capital to shareholders via cash dividends, share repurchases or debt reduction. Thus the payout ratio can rise. Tech platforms and their network effects have resulted in a winner-takes-all market, with “wide digital moats” protecting the over-sized returns of these new global champions. Disruptive innovation will affect all economic sectors, not just information technology. As a result, we believe it is ever more important to favor companies with a demonstrated ability to produce free cash flow and allocate that cash flow wisely between return of capital options and reinvestment/acquisition opportunities. When analyzing companies it is often useful to express ROE (profits divided by equity), as the product of three components that can be examined separately (Figure 1). Technology has had a positive impact on all three components — profit margins, asset utilization, and leverage. The first component of what is called the DuPont formula is profit margins, which have soared over the last two decades. New technologies allow for improved margins essentially because firms can have lower labor costs per dollar of sales. The retail sector offers a good example. If a retailer can hold revenues constant while it is substituting technology for labor (this is a big assumption), its profit margins are going to go up. Even beyond retail, where e-commerce has thrived by dramatically reducing transactions costs, there is enormous scope for additional substitution of technology for labor. Another way to illustrate this point is by looking at manufacturers’ profit margins, which have improved markedly over the last two decades (Figure 2). Manufacturers’ margins averaged 5.5% in the post-WWII decades, but since 2001 have roughly doubled. Naturally enough, many commentators have wondered whether margins can remain elevated or if some form of mean reversion is inevitable. Source: Empirical Research Partners. Net profit margins for S&P 500 companies, trailing 4 quarters, smoothed. With so much debate regarding what has driven this dramatic expansion and whether or not it is sustainable, we look at Figure 3, which breaks down the margin expansion into four drivers. While we are unlikely to witness further gains from two of the factors (offshoring and lower interest rates), there has been much discussion in Washington, D.C. about cutting the effective corporate tax rate. Further, we believe there is tremendous potential to further improve margins through “wage savings from more efficient domestic plants.” This last factor translates to technological innovation. Overall, this leads us to conclude that higher margins are likely sustainable. We believe this because, over the last 20 years, U.S. manufacturing output has increased 87%, even as manufacturing employment declined by one-third. This development largely reflects advances in automation and technology; advances which have much further to run over the next decade or so, and will continue to be a positive factor for margins. Figure 4 demonstrates that the improvement in margins and profitability extends well beyond the manufacturing sector. Corporate profits, as a percent of GDP, averaged 5.8% from 1952 to 2001, but have since soared to an average of 8.7% (a remarkable 50% increase in the profit share of GDP). There are two key drivers of this improvement — lower capex requirements and a smaller share of GDP going to labor. With new developments in technology, we believe that capex requirements will continue to decline in importance, even as expenditures on software and R&D become more crucial. Figure 5 shows that business investment averaged 53% of U.S. corporate profits from 1970 to 2001, but this has declined to an average of only 20% since then. While capex will always have an important cyclical component, over the medium to longer term we expect it to constitute a much smaller share of profits than it has historically. While technology has meant higher returns on capital, which is great for investors, its flip side means a shrinking proportion has accrued to labor (Figure 6). Additionally, technology has been associated with increased income inequality, declining labor force participation, a dampening of wage growth, and the loss of jobs in a number of sectors. According to Laura Tyson (former chair of the Council of Economic Advisors), “Among economists the consensus is that about 80% of the loss in U.S. manufacturing jobs over the last three decades was a result of labor-saving and productivity-enhancing technological change, with trade coming a distant second.” We agree with this assessment and believe this unfortunate trend is likely to continue for the next couple decades. There has been a downward trend in both labor share and the labor force participation rate (LFPR) since the early 1950s. Source: Epoch Investment Partners, Bloomberg. Corporate profits are included in GDI but not GDP, which is the key difference between the two metrics. The declining trend in labor’s share can also be illustrated by developments in the retail sector, which provides a good case study for the implications of technology for employment. E-commerce has been around for quite a while, but its impact has been most profound since August 1998 when Amazon announced plans to move beyond books (apparently with the intent to ‘sell everything to everybody’). In recent years, online retail sales have been growing by a solid 15% per year, which is roughly four times the growth rate for traditional brick-and-mortar retailers. However, despite this much faster sales growth, the share of retail employees that work for internet retailers has barely budged. This reflects a much lower employment-to-sales ratio, a trend which shows no signs of reversing (Figure 7). Source: Epoch Investment Partners, Bloomberg. Indexed to 100 at 1/1992. Core retail employment excludes autos and gas. To appreciate the trends in profitability and labor share, it is important to understand that one key feature of technology is the prevalence of markets in which revenues flow primarily to the top players in the space. This occurs because digital businesses are often associated with winner-takes-all dynamics in which capacity constraints are less relevant, and in many cases the marginal costs of production and distribution of digitized products approaches zero. The resultant economies of scale gives market leaders a huge cost advantage. Equally important to the winner-takes-all phenomenon are network effects. Just as low marginal costs create supply-side economies of scale, network effects can create demand-side advantages to scale. Facebook is probably the best known and most frequently cited example. Additionally, indirect network effects can also be powerful. For example, an increase in the number of iPhone users will encourage more app developers to invest in the platform. One impressive result is that Apple’s global developer community has earned over $70 billon since the App Store was launched in 2008. Further, with platform markets and network economics, top performers have the opportunity to win more customers, both in the U.S. and globally, while the next-best performers often face harsher competition and much lower revenues to cover their (similar sized) cost base. For example, by dramatically reducing transactions costs, internet retailers have captured 65% of U.S. retail sales growth over last two years, with the bulk of this going to Amazon. Other successful platforms that are both capital-light and employ relatively few workers include Netflix in media, Uber in transportation and Airbnb in short-term accommodation. In sectors subject to such disruptive innovation, the small number of winners is dwarfed by an ever growing list of laggards, unable to shake off their legacy business models. As new technologies have strengthened network effects, there has been an associated increase in sector concentration. In fact, more than 75% of U.S. industries have experienced an increase in concentration levels over the last two decades (lax anti-trust enforcement has been an important secondary factor). Further, U.S. firms in industries with the largest increases in product market concentration have enjoyed higher profit margins and higher return on assets (Figure 8), which suggests that market power is becoming an increasingly important source of value. ROA is higher in U.S. Industries with increased concentration. Consistent with a winner-takes-all economy, Figure 9 shows that firms in the 75th and 90th percentile have enjoyed dramatic increases in their return on invested capital (ROIC) since the turn of the century. Further, there appears to be significant persistence to these over-sized returns, suggesting wide digital moats are keeping potential competitors at bay and preventing them from bidding returns down toward their WACC as textbooks state should occur at the margin in equilibrium. We now move on to asset utilization (sales/assets), which is the second component of ROE. It also improves with technology as you have higher sales per dollar of physical assets (plant, equipment and inventories), because we are in an asset-light world. Again, this can be illustrated by the retail sector, where internet sales are growing in importance, reducing the need for bricks and mortar. If you can hold revenues constant, this is a good thing for the owners of any business. This point can also be made by comparing traditional taxis and ride sharing services such as Uber and Lyft. In most cities, the taxi industry is highly regulated and utilizes technology developed in the 1940s. However, internet-based driver-passenger matching technology is much more efficient, allowing Uber drivers to spend a significantly higher fraction of their time with a passenger in their car than do taxi drivers. The evidence so far suggests that, on average, the capacity utilization rate is 30% higher for Uber drivers than traditional taxi drivers (Cramer and Krueger, American Economic Review, 2016). Trends in a number of U.S. financial ratios that are related to asset utilization are summarized in Figure 10. Note the dramatic declines in the first three ratios (capex/assets, fixed assets/assets and inventory/assets), all consistent with an asset-light world. Additionally, there has been greater R&D spending, as well as more cash on firms’ balance sheets. These trends have also allowed companies to markedly increase their payout ratios to shareholders. Overall, the evidence seems quite unequivocal that the introduction of new technologies has been positive for asset utilization. The third component of the DuPont ROE calculation is leverage, measured by dividing a company’s total assets by shareholder equity. If you don’t need as many assets to run a business, you can return excess capital to the shareholder by buying back shares, raising the cash dividend, and paying down debt. In other words, the payout ratio can rise, as has clearly been the case. Companies don’t need as much capital today because they have embraced technology. Further, if you can find industries applying technology in this way, they will continue to grow, regardless of what happens with interest rates. The implication that payout ratios are likely to rise is especially important to Epoch, as it provides a promising backdrop for shareholder yield strategies. As an aside, this note has only indirectly discussed the profound implications of technology for the macro environment. For example, productivity is likely to improve, although measurement issues are a growing concern. Regarding the labor market, we expect continued downward pressure on wages, increased income inequality and considerable employment dislocations in the medium term. Further, technology acts to dampen inflationary pressures and flatten the Phillips curve, challenging the traditional approaches and policies of central bankers. It also implies the Federal Reserve can tighten slowly and gradually (and by much less than the dot plot suggests), and that nominal bond yields will rise only moderately. All of these issues will be discussed in a companion article to come. For a start, we believe the trends discussed above all point to higher ROE and technology is behind this positive development. Additionally, platform technologies, network economics and winner-takes-all markets favor global champions. There will be more laggards than winners, and investors need to be wary of value traps, as many seemingly cheap companies struggle in the face of disruptive innovation. Further, we believe firms with a demonstrated ability to produce free cash flow on a sustainable basis and allocate it wisely will outperform common equity benchmarks. Other important insights suggest that dividend payers have plenty of scope to raise their payout ratios in this emerging world where tech is the new macro. Futhermore, the wide digital moats of the winner-takes-all market support the persistence of higher ROIC. Thus companies that have historically allocated capital effectively to internal projects and acquisitions, earning a ROIC above their cost of capital, should be able to continue doing so. Epoch has always favored companies that possess superior managements with competent capital allocation policies, believing they are the most probable winners. These attributes are likely to be even more important going forward, as management is tasked with creating value by marshalling talent and technologies during a period of unprecedented innovation and disruption.